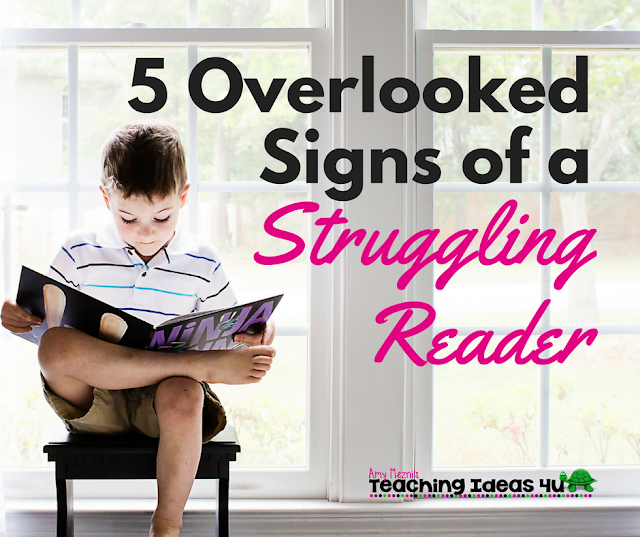 As a teacher, I really thought I knew all about reading problems and how to spot them. I mean, we talked about dyslexia and other issues in my master’s program. However, I was never really taught to identify signs of other possible problem. In general, I don’t believe many training programs adequately prepare teachers for this aspect of our job. Every year I talked with his teachers and mentioned these struggles – all signs of a problem – and none of us picked up on it. And my son has had AMAZING teachers! As teachers, how can we tell when there may be a hidden problem with our students? Don’t laugh. Until you have your own child scream for 4 hours (not exaggerating) because he or she doesn’t want to read for 10 minutes, you really can’t believe that the parents are telling the truth about the homework struggle. I continually brought this up with my son’s teachers. Math homework wasn’t a problem. Reading, however… I just can’t even explain the torture. Now, if I was reading to him, he was thrilled to read. If I asked him to read, all bets were off. HOURS. I am not joking. I tried to explain that his screaming was taking far more time than just doing the reading, but he didn’t care. Yes, friends, I often just gave up. It was so exhausting to struggle with him that by bedtime I just couldn’t do any more. Now when parents tell me that their child is refusing to do the work for hours, I no longer just chalk it up to a power struggle. If the child has a pretty good relationship with the parent and doesn’t seem to have other issues that stand out, pay attention to this refusal to do homework. It may not be a vision problem, but I truly believe this is often a big red flag that there is a problem. I had a student last year that was diagnosed with ADD – and the homework struggle was one of the things the parent discussed with me. The family felt a lot of relief at finally discovering why she struggled so much when it didn’t seem like she should be. I know many primary teachers are tuned into this, and I noticed my son struggled with letter-sound matching, but it didn’t occur to me that it may be a sign of a larger problem. Now, emerging readers may not know all of their phonemes, but I am talking about a third grade student that could not tell you what sound a letter made. Blends? Let’s not go there. My son is going into sixth grade next year and I still review these with him. This struggle with phonemic awareness is another red flag that there may be a deeper problem. As a student’s reading level increases, his or her ability to recognize words should also increase. Students with an underlying vision problem really rely on sight words to get them through a passage. Once it becomes harder to have all of the words memorized, the student struggles more and more with reading comprehension. My son was always able to squeak on grade level by the end of the year – which we all know means he was basically a year behind. However, throughout the primary grades, he was always on grade level – or higher – in everything but reading. I never could understand how he could be above grade level in every other subject but have such a struggle in reading. I know now that he basically tried to memorize everything and learned through the teacher’s instruction. He did well when you explained it to him, but he couldn’t figure it out on his own. 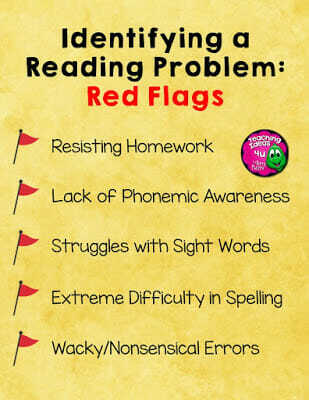 As students transition to reading to learning, vision issues will cause more and more problems. 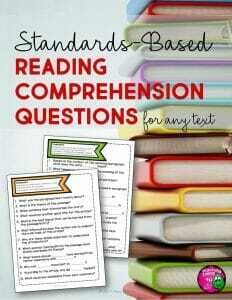 If a student seems to understand the material but fails reading and written work, that may be another red flag. I have almost given up on spelling. I mean completely. My son cannot spell. It is a nightmare. I have tried every spelling trick I can think of – as well as all my teacher friends’ ideas – and he still at best gets a C on a spelling test. And when a C comes home, it is party time. Seriously. Now, there are many people that just struggle with spelling. This is that times a million. For example, I tried having him pretest and then only focus on the words he didn’t know. Yea, that bombed. Every day he spelled different words correctly and missed other words. We tried doing them orally. Same thing. Tried writing them, nope. Tried grouping words in word chunk or CVC families. Bombed. He is just at the point where he has decided it doesn’t matter, because even if he studies he will get the same grade. And honestly, he is right. Again, poor spelling by itself may just be poor spelling. However, poor spelling combined with other red flags may be a sign. Okay, I know that title is really specific, but it honestly is how I think of it. If you have a student that seems to do strange things and also has other red flags, there may be something going on. Let me explain some of the things that I started to piece together for my own child. – He would copy most things wrong. How can you spell words that you copied incorrectly from the board? – He still struggles with words that are very similar. ex. Were, we’re, where; though, through, thought, thorough. Every time he hits words like this, his reading stops while he figures out the word. What happens in the meantime? His comprehension plummets because he spent all his brainpower on figuring out the word. – He passed vision exams yet appeared to not see correctly. Yep. He once failed a test and I was so excited because I thought we finally had solved our problems. His prescription was so low, and when we finally got with a therapist, we discovered that the glasses actually just made his vision worse. – The ability to read larger print books, but not smaller text. My son could read texts that were larger font and double spaced, but struggled as fonts got smaller and spacing got tighter. This was a big light bulb for me, because if he were really such a poor reader this didn’t make sense to me. I hope these tips help you. I know I was really surprised to find out many of these are common signs of a problem. Do you know of any other red flags? To learn more about vision problems, please read my blog series. I also have learned some strategies for helping your struggling reader.